If we find ourselves graced with an abundance of summer tomatoes, we make several batches, dice the tomatoes, and freeze them for the winter. There's nothing like a bit of fire-roasted goodness in the depths of winter! As always, the freshest tomatoes work best for this method. Pick ones that have a tight skin and smell strongly of ripe tomato. Wash the tomatoes and slice them in half, leaving the skins on. Arrange them on a baking sheet with the cut side down. Move an oven rack to the highest position and turn on your broiler. If you have the option, set the broiler to high. Broil the tomatoes until the skins are blistered and blackened. Rotate the pan a few times for even roasting. This should take about 5-10 minutes. 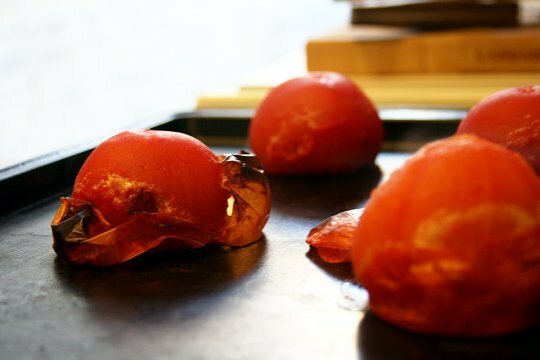 Let the tomatoes sit until cool enough to handle and then slip the skins off. These tomatoes can be substituted in any of your favorite recipes. We particularly like them in salsas, pasta sauces, and cold salads.